There is a possibility of damaging winds and large hail as the squall line of storms moves across Missouri and into Illinois. ST. LOUIS — Expect another warm and windy day in St. Louis as temperatures rise toward 80 degrees Wednesday afternoon. A storm system is moving in from the west, bringing mid and high cloudiness and those gusty winds. Warm weather continues for the bi-state. Rain holds off until after dark. Wednesday evening, a line of strong to severe thunderstorms will race across Missouri, impacting the St. Louis area after 11 p.m. There is a possibility of damaging winds and large hail as the squall line of storms moves across Missouri and into Illinois. 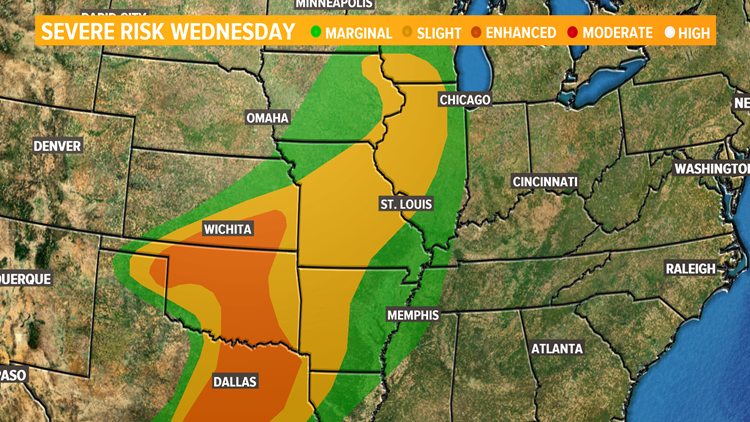 A tornado threat appears to be low, but severe weather may wake you up overnight. Stay with 5 On Your Side and keep your mobile alerts on tonight to be notified of any severe weather in the area. Thunderstorms and showers will be in the St. Louis area for Thursday morning, with the severe threat easing away. A cold front will cross the St. Louis region Thursday, leading to more showers and a few thunderstorms into the afternoon, though severe weather will no longer be a threat. High temperatures will cool off into the 60s. Friday is cloudy, with a few morning showers, and much cooler. Highs in the 50s for Friday. Warmer and dry weather is forecast for the weekend.